Rated PG-13 for violent captivity and violent rebirth. It took me a long time to get situated in this world. I wondered for a significant amount of time if Chesirah was the size of a bird, or a person? Is this a “future fantasy” story or a classic fantasy story? Are the ships spaceships or boat-ships? It was extremely apparent that this is the prologue to a longer story. I would have found my bearings quicker in this story with some clues a book jacket may have provided! I still love stories of self-liberation from oppressions so that was satisfying. I really liked the setting and characters. This was a very engaging story, and I didn't feel like it was incomplete or too prologue-y. It did seem strange that race/species based slavery of sentient people was condoned in society when there were apparently many non-human races mingling together. The doll maker was a particularly nasty character. 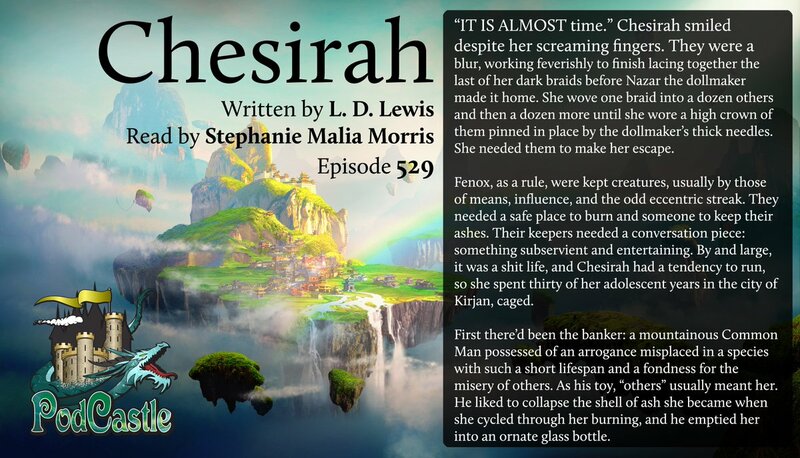 I liked that Chesirah was considering helping others at the end, but didn't rush immediately into making it her life's work. The ending felt like the right choice for the character.